Episode Zero -Promise- is a novella written by Jun Eishima. It follows the lives of the main characters right before the start of Final Fantasy XIII. It was originally released on the official Japanese site of the game during the months leading to the release of the game, and later on as a book. The ISBN number of the book is 978-4-7575-2770-6. 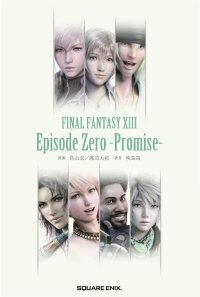 Episode Zero was released in English as an extra in limited collector's edition of FF13-2. Considering three of the chapters have been released for free online, they've been archived at the site. The remaining chapters have summaries.